Different strains of common dermatophytes including different mating strain, collected from clinical, animal and soil sources as also some tester strains, were studied for their proteolytic enzyme activity during vegetative and sporulation phases. Sabourausâ€™s dextrose broth and Takashio broth were used to induce vegetative and sporulation phases respectively in these dermatophytes. All the strains of T. rubrum showed very low enzyme activity during sporulation when compared vegetative growth phase. In other species of dermatophytes. The enzyme activity was found to be almost similar during both the growth phases. High protease production in association with one mating type of A. vanbreuseghemii was observed. The enzme activity of clinical isolates of the non-anthropophilic species such T. simii, M. nanum and M. gypseum were relatively low when compared to T.mentagrophytes var. interdigitale and T. tonsurans. The severity of the lesion produced by these established the fact that protease in dermatophytes has a define role in pathogenesis. Protease production during sporulation in T. rubrum may be one of the selective advantages of this species. General protease production was found to be independent of mating type in most of the dermatophyte species. A study was undertaken from October 1997 to March 1998 with 900 subjects, 806 male and 94 female, attending the STD clinics in Calcutta. The study revealed 2.3% HIV seroposivity and 3.88% VDRL positivity among them. Evidence of combined infection (HIV and syphilis) has been observed in10 out of 900 subjects (1.1%). Highest prevalence of HIV seropositivity (13.3%), VDRL reactivity (16.6%) or both (6.6%) was noted among young males up to 30 years of age. Anthrax, a zoonotic illness of herbivorous animals has caused epidemics in livestock and in man since antiquity. In India, the disease continues to be endemic, resulting in a few sporadic cases and outbreaks in human population. Such an outbreak was noted at our institute. Clinical and laboratory data of 15 cases of cutaneous anthrax recorded between July 1998 to June 2000 at the Department of Dermatology and STD. JIPMER hospital, Pondicherry was reviewed. There were 8 males and 7 females in our series of 15, with a mean age of 20.3 years (range 11 months to 56 years). The children (10) outnumbered the adults (5). In most of the cases (9) there was history of death of cattle, sheep or goat in the house or in the neighbourhood. The commonest site of cutaneous anthrax was face (7 cases). Regional lymphadenitis occurred in one case and systemic features like fever in four cases. Majority of our cases responded favourably to crystalline penicillin. Smear taken from the vesicle fluid and eschar demonstrated typical large and thick Gram positive bacilli singly or in short chains. The organism could be cultured from cutaneous lesion in six cases only and blood culture was positive for Bacillus anthracis in one case. Cutaneous anthrax is the commonest form of human anthrax. There is increasing evidence to suggest that files and mosquitoes play a role in the transmission of Bacillus anthracis to human beings. Since 20% of untreated cases of cutaneous anthrax develop bacteraemia which leads to rapid death, it is important that the disease is recognized and treated earnestly. Therapeutic dilemma often arises in leprosy patients developing jaundice as most of the anti-hanseniasis medicines are hepatotoxic. One 26 year old lady and another 21 year old male having paucibacillary leprosy developed signs of jaundice after onset of treatment with multidrug (MDT) and then they discontinued it. MDT was reintroduced and successfully continued for 6 months with pre-and post- therapy monitoring of liver function test, haemoglobin and other relevant parameters. Total bilirubin (TB) reached maximum upto 3.6 comprising predominantly of unconjugated (3.1); other parameters were normal . The third patient 64 year old male with multibacillary leprosy having past history of recurrent jaundice has also been treated for last 8 months till date with MDT by monitoring. Highest peak of TB was 4.2, unconjugated being 3.4. These represented cases of Gilbertâ€™s syndrome which is a common, benign, familial unconjugated hyperbilirubinaemia without overt haemolysis are often precipitated by drugs. Partial deficiency of bilirubin glucuronosyltransferase is the main causative factor. Hence all patients of leprosy with jaundice does not need discontinuation of therapy. Some patients may have underlying Gilbertâ€™s syndrome when MDT can safely be continued with monitoring. Sixty year old female patient presented with asymptomatic persistent cutaneous nodules and plaques since childhood. Dermatological examination revealed firm, non-tender nodules and plaques (more than fifty) seen over the extremities, thighs, abdomen and back. 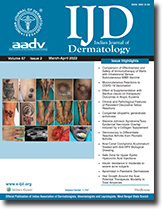 Histology was consistent with dermatofibroma. Conversion disorder is not normally listed amongst the conditions in differential diagnosis of leprosy neuropathy. A case conversion reaction who was initially diagnosed as neuritic leprosy is reported. Patient responded to narcosuggestion and psychotherapy. A 55 year old woman presented with gradually progressive erythematous scaly plaques, simulating psoriasis, on extremities and face last 20 years. Histology confirmed the diagnosis of lupus vulgaris which is known for its notorious presentations. The case is being reported for its unusual presentation which can cause diagnostic and therapeutic problems. A case of cutaneous leiomyoma in a zosteriform distribution over right upper limb is described. Differential diagnoses and treatment options are discussed. A seven year old male child, born of a consanguineous marriage is reported for the rare occurrence of severe hypercholesterolaemia with cutaneous and tendinous xanthoma, mental retardation and eosinophilia in his childhood. Ochronosis is a rare disorder, which presents with distinct clinical and biochemical features. A fifty seven year old male presented with fracture femur, osteoarthritis, Oslerâ€™s sign, alkaptonuria and cutaneous ochronosis. Though the clinical progression of his alkaptonuria was typical, he presented interesting features including non-uniting fracture and arthritis of big and small joints. A 25 year old female presented with discharging sinuses over breasts for 6 years duration. On the basis of FNAC report suggesting non-caseating tuberculosis, she was treated with ATD for 18 months without success. Subsequently, black grains were detected from the discharge of the sinuses and Str. Somaliensis was grown in culture. The site being a covered area was considered as an extremely rare site for occurrence of the disease. Acne agminata or lupus miliaris disseminatus faciei is a chronic granulomatous inflammatory disorder-affecting adults of both sexes which terminates spontaneously with scarring. Histopathologically, the papules show granulomas consisting of epithelioif cells, Gaint cells, with or without caseation necrosis along with periappendigeal lymphomononuclear cell infiltrate in the dermis. The exact aetiopathogenesis of this condition is still unknown. We report 3 cases of this uncommon dermatoses recently seen by us. An eight year old girl presented with progressive stiffness of the right lower limb resulting in joint immobility and apparent shortening causing limitation of movement.